What would happen if a major city flooded? I've read several books where a major city, often New York City, floods. People live in the skyscrappers, sometimes for years afterwards. What would it be like if a city full of high skyscrapers was flooded for some period of time? Start with the initial impact, and include what it might be like until all of the buildings fell down. I'm most interested in the effects on the buildings, and how (if?) a culture could thrive in said buildings after the disaster struck. A likely scenario that could trigger this is the sudden melting of either the Greenland or Antarctic ice sheet, for instance, but I'm not interested in the mechanism that caused it, more in the effects. Also, assume that the flooding happened something like the tide coming in, but it just kept building itself higher, such that there was enough time to react to the change, but not necessarily evacuate the city. The skyline would become an eerie monument to the dead. The Manhattan borough of New York City is a particularly interesting case study given that it has approximately 1.6 million people who live there and typically sees its population double during a work day. That’s three million people, a majority of which are going to be in those buildings. If this flood happens in less than twenty four hours, you’re not going to see many people successfully leaving the city. That means you’re looking at millions of people potentially stranded in buildings, assuming they’re lucky enough to be in structures higher than five to ten stories depending on location. There will be no power. The available food will probably be limited to what white-collar workers brought in for lunch. You are now looking at millions of people stranded without the proper resources to survive. Lots and lots of people are going to die inside these buildings. Now consider the bigger picture. The image below shows areas likely to flood at a variety of possible future sea levels. 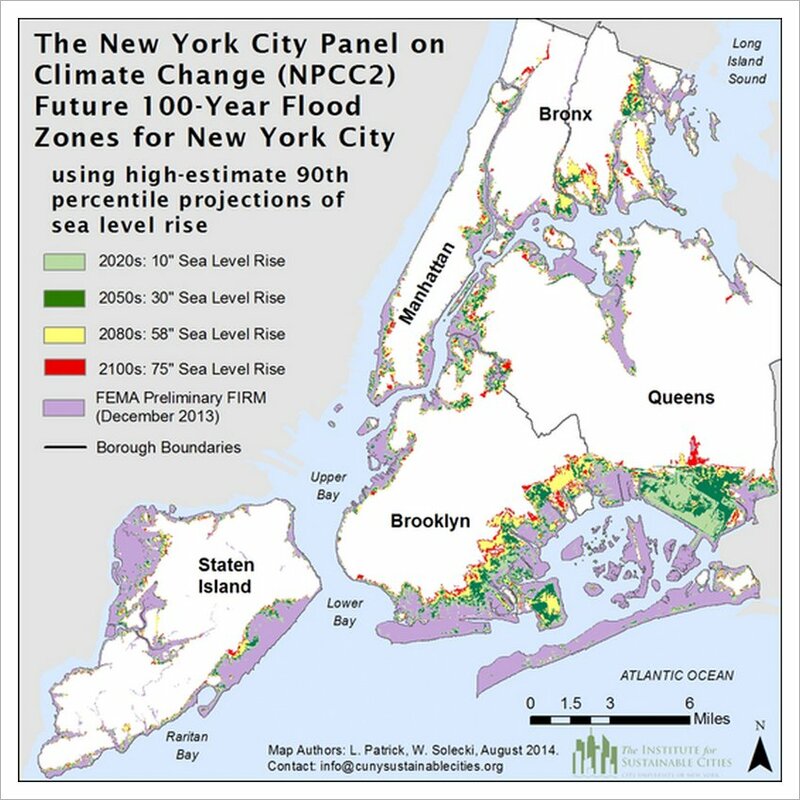 What’s somewhat surprising about this image is just how much of a sea level rise you would need to actually flood the entirety (or even just the majority) of Manhattan. If this kind of sea-level rise occurred in here you can be sure it’s happened everywhere else. Now you’re not only dwarfing the hundreds of thousands (if not millions) of casualties in Manhattan, but you’re making it extremely unlikely that there will be any rescue attempt to save the survivors. Long term, you now have over two hundred steel graveyards reaching into the sky. The people trapped in the buildings are not going to live long enough to become a culture. And attempting to move into them afterward means you not only need to build the infrastructure to survive, but you need to deal with the millions of bodies decomposing. In case that wasn’t troubling enough, seawater is very corrosive. These buildings were not constructed with the intention of remaining structurally sound when submerged in seawater for extended periods of time. In the event of a disaster on this scale, New York City would finally get a chance to sleep. Not the answer you're looking for? Browse other questions tagged science-based cities natural-disasters or ask your own question. In a city where cars are forbidden, would any major change happen? How to build a tsunami proof island city? What sort of gas is thick and does not disperse easily in an urban environment? How quickly could a major city disappear off the face of the Earth? What would be the most likely cause of a major flood in London and what would the effect be to buildings? How possible would it be for a whole city (and smaller towns) to be built on water?